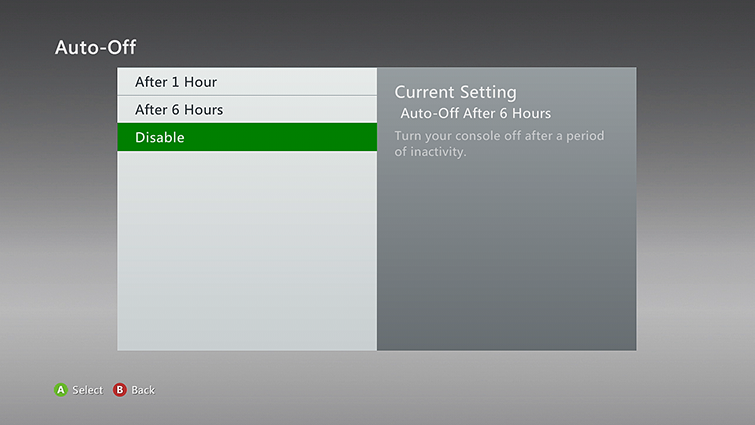 The Auto-Off setting is enabled, and the console has been inactive for 6 hours. The console is too hot. There's a problem with the power supply. Highlight Auto-Off. View your settings on the right side of the screen. If the Auto-Off setting is disabled, go to step 8. If the Auto-Off setting is enabled, select Auto-Off, and then select Disable. Turn off the console. Wait about 10 minutes, and then turn the console back on. 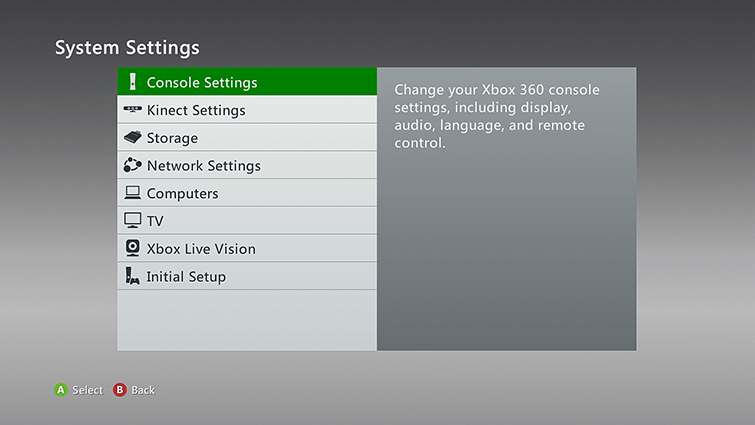 If the power button is flashing red, go to the Xbox 360 Flashing Lights Solution. 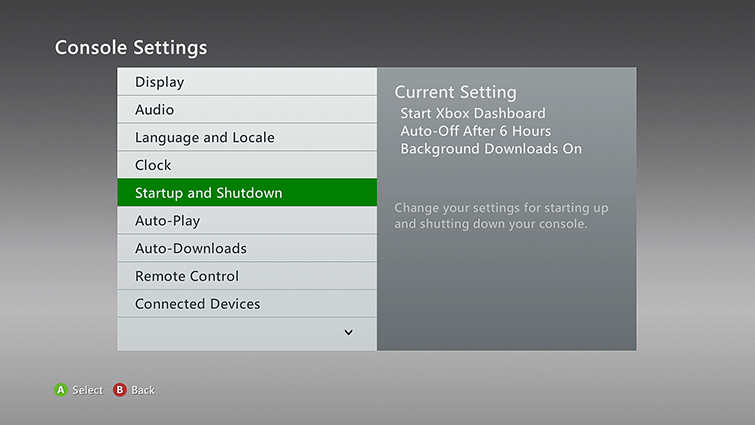 Note If you have an Xbox 360 S console, wait for the red light to stop flashing before proceeding. If the problem still occurs, request a repair. Solid green or solid orange light: Your power supply is working. If your console won’t turn on, try the Xbox 360 No Power Solution. Plug your console’s power supply into a different electrical outlet. Do not use a surge protector. If the power supply light is solid red or flashing orange, unplug the power supply and let it cool for 30 minutes. Then, plug the power supply back into the outlet. If your power supply light is still flashing orange or solid red, or is unlit, your power supply needs to be replaced. 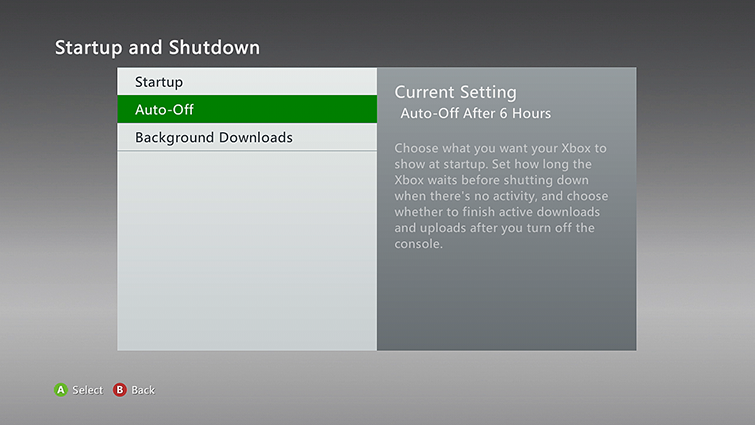 You can order a replacement Xbox 360 power supply from the Xbox Online Service Center. Console registration is required to replace the power supply under warranty (the power supply warranty is the same as your console warranty). Would you like to contact Support regarding the "Xbox 360 console turns off unexpectedly" issue you were reading about or a different issue?